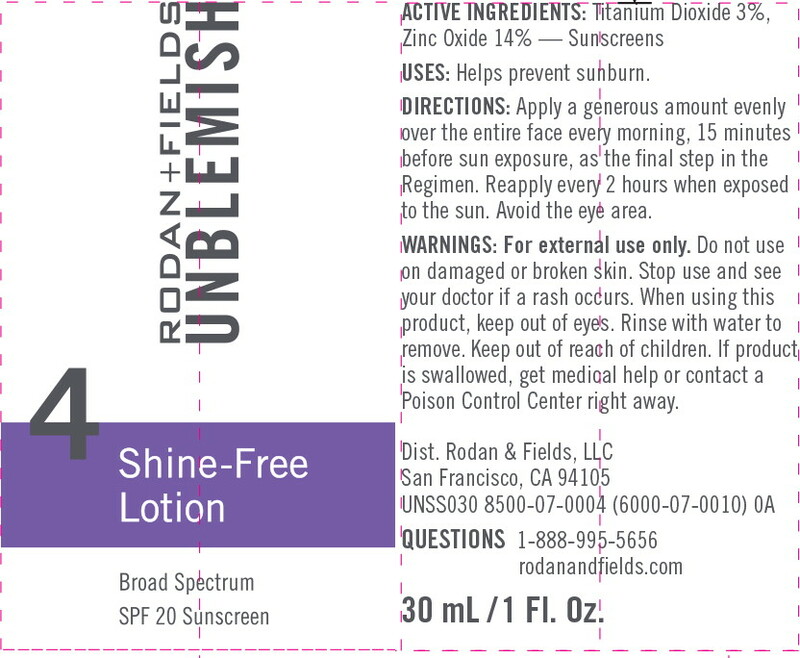 Proprietary Name: Unblemish Shine Free What is the Proprietary Name? 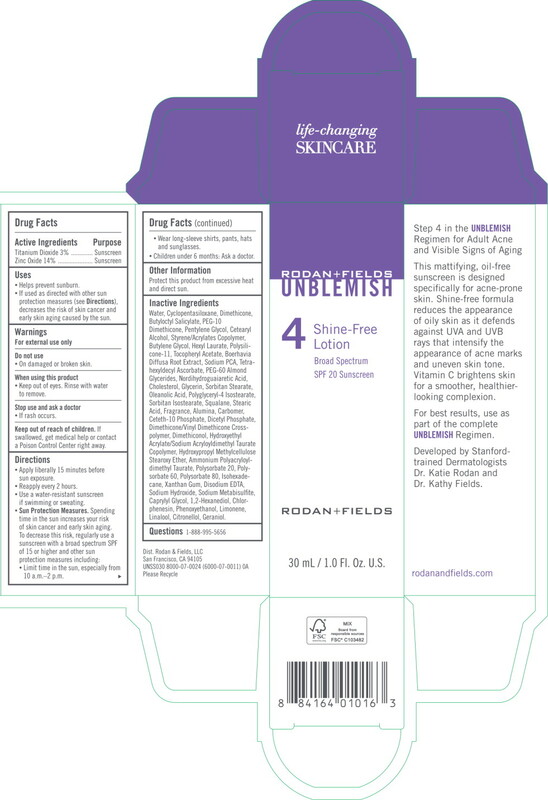 Unblemish Shine Free with NDC 14222-2130 is a a human over the counter drug product labeled by Rodan & Fields. The generic name of Unblemish Shine Free is titanium dioxide, zinc oxide. The product's dosage form is lotion and is administered via topical form. Lf used as directed with other sun protection measures (see Directions), decreases the risk of skin cancer and early skin aging caused by the sun. Do not useOn damaged or broken skin. Stop use and ask a doctorIf rash occurs. Sun Protection Measures. Spending time in the sun increases your risk of skin cancer and early skin aging. To decrease this risk, regularly use a sunscreen with a broad spectrum SPF of 15or higher and other sun protection measures including:Limit time in the sun, especially from 10 a.m.-2 p.m.
Water,Cyclopentasiloxane,Dimethicone, Butyloctyl Salicylate, PEG-10 Dimethicone, Pentylene Glycol, Cetearyl Alcohol, Styrene/Acrylates Copolymer, Butylene Glycol, Hexyl Laurate, Polysilicone-11, Tocopheryl Acetate, Boerhavia Diffusa Root Extract, Sodium PCA, Tetrahexyldecyl Ascorbate, PEG-60 Almond Glycerides, Nordihydroguaiaretic Acid, Cholesterol, Glycerin, Sorbitan Stearate, Oleanolic Acid, Polyglyceryl-4 lsostearate, Sorbitan lsostearate, Squalane, Stearic Acid, Fragrance, Alumina, Carbomer, Ceteth-10 Phosphate, Dicetyl Phosphate, Dimethicone/Vinyl Dimethicone Crosspolymer, Dimethiconol, Hydroxyethyl Acrylate/Sodium Acryloyldimethyl Taurate Copolymer, Hydroxypropyl Methylcellulose Stearoxy Ether, Ammonium Polyacryloyldimethyl Taurate, Polysorbate 10, Polysorbate 60, Polysorbate 80, lsohexadecane, Xanthan Gum, Disodium EDTA, Sodium Hydroxide, Sodium Metabisulfite, Caprylyl Glycol, 1,2-Hexanediol, Chlorphenesin, Phenoxyethanol, Limonene, Linalool, Citronellol, Geraniol.